Vladimir Putin isn’t sending troops into Ukraine merely to protect Russian interests abroad. He’s also trying to protect his regime at home. As Russian forces seize key objects in Crimea, their objective is not just to create chaos in Ukraine but also to protect kleptocratic rule in Russia itself. Russia and Ukraine under Yanukovych shared a single form of government – rule by a criminal oligarchy. This is why the anti-criminal revolution that overthrew Ukrainian president Viktor Yanukovych is a precedent that is perfectly applicable to Putin’s Russia. It is also the reason why, from the Russian regime’s point of view, the Ukrainian revolution must be stopped at all costs. Russia is presently quiescent and opinion polls show that 75 percent of respondents believe that what happened in Ukraine could not happen in Russia. Public sentiment in Russia, however, is subject to dramatic shifts and, in the wake of the overthrow of Yanukovych, Russian authorities were taking nothing for granted. Hours after the closing ceremonies of the Sochi Olympics, a Russian court sentenced opposition activists to prison terms of two to four years for taking part in a protest rally in May 2012 against President Vladimir Putin’s inauguration. When demonstrators took to the streets to protest the verdict, hundreds were detained. Russia also restricted what is left of the independent press. Yuri Fedutinov, the veteran director of the independent Ekho Moskvy radio station, was removed in what chief editor Alexei Benediktov said was a “political” decision aimed at changing the station’s editorial policy. The independent television channel “Dozhd” was removed from satellite and cable networks and I was expelled from Russia, where I had been serving as an adviser to Radio Liberty. Russia and Ukraine reflect the legacy of communism, which destroyed any sense of moral values. In both countries, the rulers place the accumulation of wealth far ahead of the welfare of the nation. In Ukraine, Yanukovych took power and began to reprivatize for the benefit of himself and the members of his immediate family. In three years, his son Olexander, a dentist, became a multi-billionaire. The owners of businesses were offered below market prices for their enterprises under threat of being ruined by courts and government inspectors. In Russia the process was similar. The seizure of property began in earnest in 2003 after the arrest of the president of the Yukos oil company, Mikhail Khodorkovsky. At present, thousands of businessmen are in pretrial detention in Russia on false charges and at the behest of their competitors. To accumulate wealth so fast and on such a scale, it is necessary to eliminate independent law enforcement. The result was that in Russia and Ukraine, each person was aware that he was at the mercy of the authorities who could imprison him and seize his property at any time. It was this condition that, in Ukraine, inspired the revolt against Yanukovych. The “European choice” was popular in Ukraine not only for economic reasons but because it offered the possibility that European practices including the rule of law would be introduced there. When Yanukovych refused on November 30 to sign an association agreement with the European Union after years of promising to do so, he provoked a revolt by eliminating hope for a more democratic future. The Putin regime has traditionally been protected by high rates of economic growth, but the conditions that previously made growth rates of 7.2 percent possible no longer exist. The increase in well-being in Russia was guaranteed by the rise in the price of oil and gas, the decline in the price of imported goods, and huge underinvestment that was compensated for by the using up of the Soviet inheritance. In the absence of these factors, growth has slowed to 1.2 per cent, with little prospect of improvement. In 2011 and 2012, Moscow witnessed the biggest protests since the fall of the Soviet Union over the falsification of elections and Putin’s decision to run for a third term as president. The protests eventually fizzled but, given the worsening economic situation, they could be reignited. In February 2010, two doctors, Vera Sidelnikova and Olga Aleksandrina, a mother and daughter, were killed in Moscow when their car collided head on with a car driven by Anatoly Barkov, a vice president of the Lukoil oil company who, according to witnesses, was trying to jump the morning traffic. There was an explosion of outrage on the internet, but no demonstrations. Under the right conditions, a similar incident today might bring tens of thousands into the street. The Ukrainian revolution is a powerful example of the capacity of a people to take charge of its own destiny. The lesson would be of great benefit to Russia if it inspired Russia’s leaders to undertake real reforms. The invasion of Crimea, however, shows that the Putin has chosen to forestall change with the help of foreign aggression. This portends not only a crisis in Ukraine but a dangerous future confrontation between rulers and ruled in the world’s second nuclear power. 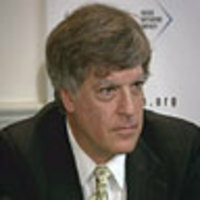 David Satter is a senior fellow of the Hudson Institute and an adviser to Radio Liberty. He is the first U.S. correspondent to be expelled from Russia since the Cold War.